Google’s paramount goal is to provide its users with the best possible search experience and they leave no stone unturned to ensure that. In early 2017, Google introduced local search filters that allowed the users to sort results based on price, ratings and hours of operation. Taking this one step further, they are now automatically applying those filters. It is user convenient for obvious reasons. They get the best possible relevant results for their search queries, on the go, THAT TOO without applying any filters. However, it’s a big blow to business owners who have failed to maintain a good online reputation. When Google automatically filters local businesses for those with 4-star ratings and higher, it places a lot of businesses at risk of losing online visibility. It’s quite common for users to search terms like “Best Plumber”, “Best Thai Restaurant” and “Best Roofing Contractor” when they are looking for a local business. Such businesses, if they do not have more than a 4 star rating, will find it extremely difficult to keep a measurable presence on local search. Nonetheless, it’s a golden opportunity for the less popular businesses. By inviting reviews & keeping the information consistent and updated, one can share the spotlight with those who are already at the top. The best of everything: Users can now filter the results automatically, by just adding “best” to the keyword. If you search “best plumber”, Google will show only 4-Star+ rated plumbers. This filter will drastically influence the way businesses are ranked. Check out below how the results differ. Open now: A closed Truck Repair store is of no use to a user who wants to get his truck repaired ASAP. 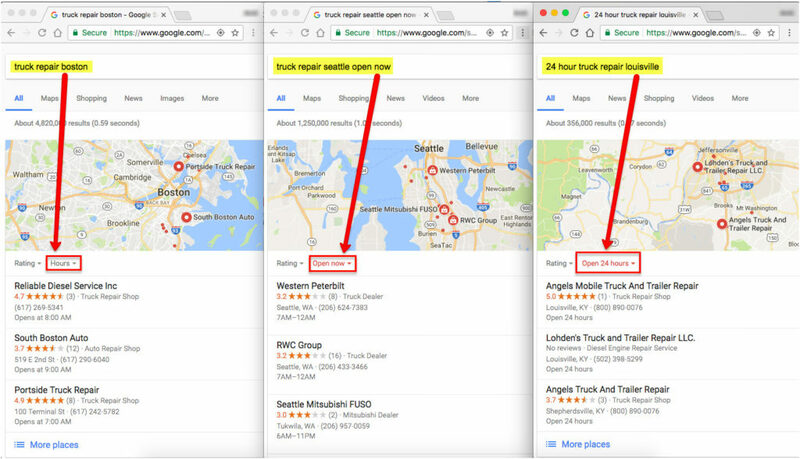 So when a user types “truck repair store open now”, Google will show only those stores that are currently open and can offer help on an immediate basis. Check out below. Enjoy Fine dining: Want to go to an upscale restaurant for your first date? Just type “fancy restaurant” & Google will show you the most expensive restaurants nearby. Or if you just want to fill your tummy without burning a hole in your pocket, type “cheap restaurants” or “budget restaurants” and you will get the list. If you see the bigger picture here, you will realize that Google is heading towards providing a more advanced search experience where users will get results based on their actual intent. Local searches have grown to 46% of all searches on Google and will continue to rise. So, Google is doing everything it can to enhance the local search experience for its users. Businesses that fail to manage their reputation and update their listings with the most accurate, detailed and consistent information now run the risk of not ranking in searches when they would have in the past. To help you get more reviews for your business, we highly recommend our review widget. It’s a small piece of code which is placed on your website and helps you get positive reviews on Google, Yelp and Facebook. In addition, it helps to filter out negative reviews too thus ensuring positive experience to website users. Need more details? Please connect with our sales rep.